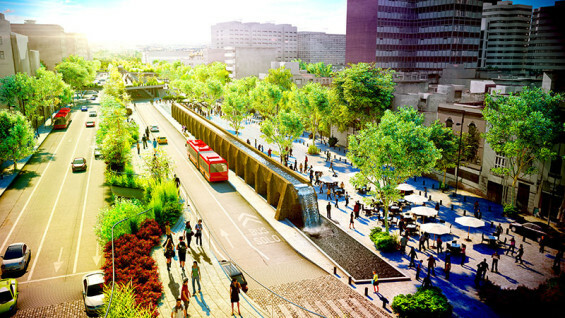 The Cultural Corridor Chapultepec (CCC) is a proposal to give back Avenida Chapultepec to the pedestrians and alternative vehicles other than automobiles. 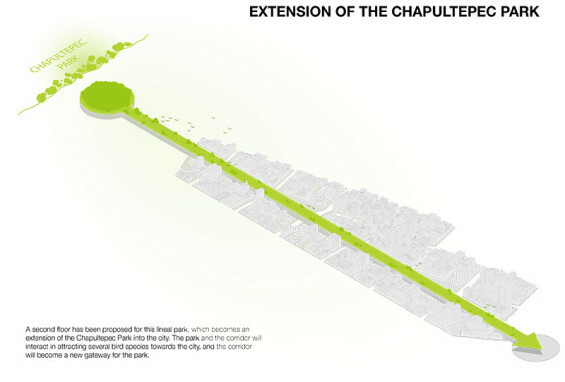 It is a finger of the Chapultepec Park that gets into the urbane space to make the citizens aware about how crucial the presence of green areas are for the life quality in any city. 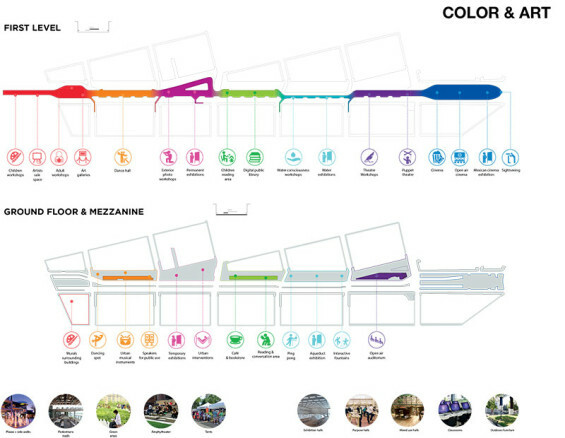 The new CCC runs from the Chapultepec Park down to the Glorieta de los Insurgentes. 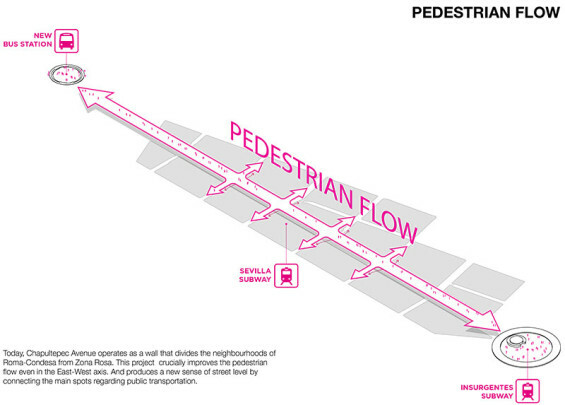 Along this area of 0.8 miles (1,3 kilometers), urban space will be reinvented. New lanes for buses will be opened and the cars will be pushed to the sides in order to broaden the central space and reach a maximum of 57 meters. The main promenade will run along the center of the avenue at street level. 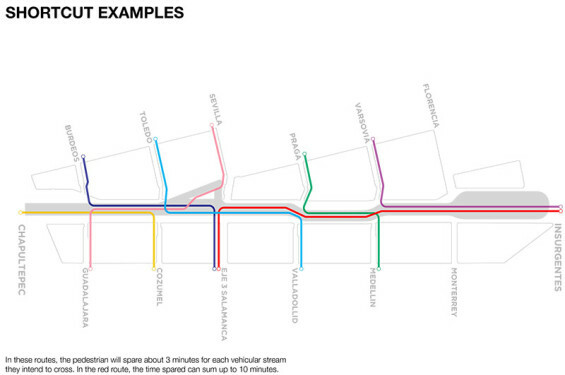 Specific lanes for bikes, skaters, wheelchairs and strollers will be built. Pedestrian crosswalks have been strategically designed in order to access the central space from the sidewalks and avoid accidents. 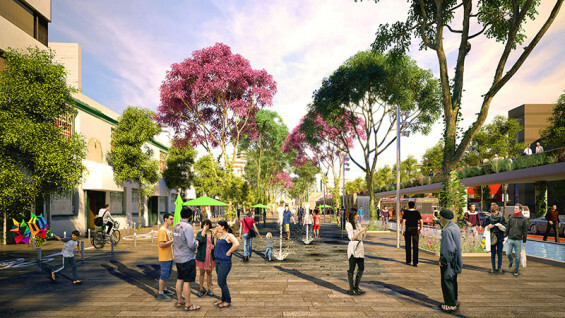 The upper level will have retail and a promenade for pedestrians with a carefully designed green landscape. 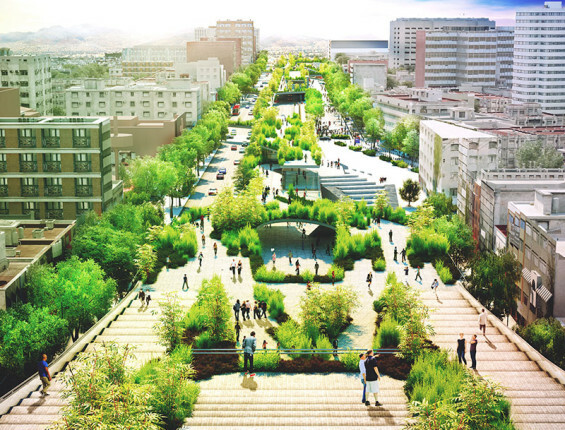 There has been a special focus in the selection of the flora according to the urban context: it will not only provide shade to the public, but it will also have a crucial impact in mitigating the “heat island” effect. For the irrigation and services, recycled rainwater will be used. Electrical energy will be provided by solar cells. The bubble decks of recycled PET will yield a positive thermic and structural impact. The CCC will transform the context by recovering its history. It will become a road to heal the diminished urban tissue and, in general, it will be a trigger to think about the urban paths in Mexico City and elsewhere in the country. Instead of being a dividing wall, it will become a meeting point and will facilitate an active mobility between both sides. Our ecological commitment compels us to take care of every single tree and to add plants that suit best this specific context. The CCC will be divided in different zones according to the blocks, so different arts will become the specific character of each part. Every zone will have a symbolic color. This way, Avenida Chapultepec will resume its rightful role as a laboratory for urban experimentation: it began as a road for the Aztec emperors, a path for the water used and drank by of the capital, the venue used by the American army, the circuit for the most modern and innovative vehicles, such as the first electric tram and the first subway.